The Quandis Military Lending Act Search offers a cost effective, real-time, all-in-one verification of Covered Borrowers with the US Department of Defense as defined by the Military Lending Act (MLA). This is a new requirement for unsecured consumer lines of credit, credit cards, unsecured closed-end loans, and non-purchase-money secured closed-end loans. If your company needs a real-time process to meet your MLA obligations, Quandis has the solution. At its simplest, Quandis MLA forwards your request to the DoD, receives the DoD’s PDF image, parses out the data and formats the results for your software to consume – typically in less than 3 minutes. This means that your results provide “safe harbor”, since the MLA stipulates that the DoD is the source of truth for safe harbor results. For more on how this interface works, see the MLA API. The DoD Site has very specific requirements and recommendations for performing searches on their site. The last name field MUST match with the covered borrower’s name in the DMDC database. Quandis offers our MLA Search with a feature that addresses individuals with compound, hyphenated or last names (includig suffixes). Quandis will run last name permutations for you as well as normalize and remove any suffix that may be included. Suffix values (eg. Jr., IV., etc) will also be removed from the last name field per the SCRA site instructions. This feature can permutate on more than two name parts and can be configured to select and limit the amount of name parts processed. We can also implement client specific permutation logic if your organization has special requirements. This permutation feature will demonstrate to your clients you have made every attempt to identify if an individual is a covered borrower. We deliver the time and date stamped official Military Status Certificate that is provided on the Department of Defense website for each individual search. All search result data is provided in an electronic format that is suitable for importing into underwriting and servicing systems. Real-time Search $0.20 per search after first 250 searches $0.05 per search after first 10,000 searches $0.02 per search after first 500,000 searches Enterprise customers may contact us regarding volume discounts. Unlimited Volume Licensing $250,000 License to Run Unlimited Volume in your Data Center. MLA API Access x x x For more on how this interface works, see the MLA API. MLA Dashboard x x x View Results and Certificate Images, Download to Excel or CSV. Support Email – up to 2 days Email or Phone – same day Email or Phone – within hour All response times are measured in business days. Quandis' MLA Search results come directly from the DMDC database, just like the credit reporting agencies results do. If you use a source of data other than the ones listed above, you will be legally liable for any discrepancies between your results and the DoD's data. Does Quandis MLA Search provide ‘safe harbor’? Yes. Quandis MLA Search performs a real-time search against the DMDC website, which is the "source of truth" for safe harbor results. The key difference between Quandis MLA and a manual search of the DMDC website is Quandis MLA Search results are returned in XML or JSON format, instead of PDF. We simply parse the PDF returned by DMDC, translating the results into XML or JSON. Does Quandis have direct access to the DMDC database? Yes. DMDC provides a website that provides a real-time search against their own database. 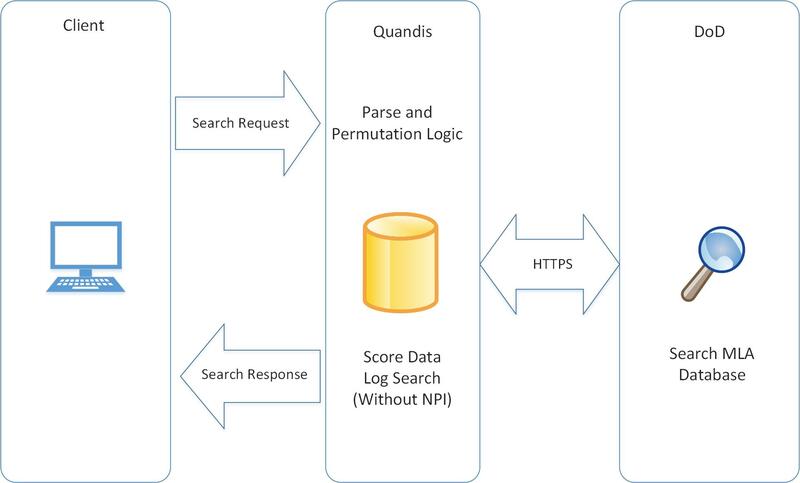 Quandis MLA Search uses the DMDC website to perform real-time searches, and translates the PDF results into XML or JSON for easy consumption by underwriting systems. How can I prove my Quandis MLA Search results are ‘safe harbor’? DMDC provides a "certificate number" that is unique to each search, and can be used to audit the results. Quandis MLA Search extracts this certificate number from the PDF, and includes it in the XML or JSON results. This certificate number provides proof that the search was done against a "safe harbor" data source. If my applicant is a spouse of a military active duty member, how do I determine if the spouse is covered? The DMDC database contains military service members, as well as their dependents -- in short, all covered borrowers. If your applicant is named John Doe, and is married to (or otherwise a dependent of) Jane Doe (an active duty service member), you don't need to search for Jane. If he's covered by the MLA, John Doe will be listed in the DMDC database. With that said, make sure your names match! John Smith Doe is not the same as John Doe. Quandis' name permutation logic will automate such checks for you. Does Quandis store any Non-Public Personal Information used in searches? No. Social Security Number and Date of Birth are required to perform a MLA Search. Quandis does not log or store any other non-public personal information (NPI) by default. The information is encrypted end-to-end through Quandis' infrastructure, and passed to the DMDC website when performing a search. Once the search has been performed, the NPI is discarded. If the DMDC website is down, can I still get results? Note that if you wish us to queue your request for future processing, we will need to store the SSN - encrypted, of course. How does Quandis MLA Search differ from the credit bureau MLA status? The source of data for both Quandis MLA Search and the credit bureaus is the same - the DMDC database. Note that the credit bureaus do not have a copy of the DMDC database; they use the DMDC API via the DMDC website to retrieve the information. In short, the credit bureaus get their MLA results from the same website Quandis does. The Quandis MLA Search results are always performed in real time. When you get credit bureau results, the MLA results may be up to 30 days old. Is not otherwise a dependent under any of the other statutory definitions. Which loans are covered by this rule? Creditors must allow the borrower to prepay the loan and can't charge a penalty or fee for prepaying all or part of the loan. How do I determine who is a ‘covered borrower’? When you pass Quandis your borrower name and SSN, we will perform a real time search against the DMDC website, returning XML or JSON indicating whether the borrower is a covered borrower. Using the DoD’s Defense Manpower Data Center (DMDC) Database. Using a credit report provided by a national consumer reporting agency, or a reseller of that credit report, that complies with the Fair Credit Reporting Act (FRCA). Use of alternative or regional credit reporting agencies would not provide a safe harbor. What is the timing of the determination? The creditor may rely on the information obtained from either method if the creditor obtains it within 30 days prior to the time the consumer initiates the transaction or applies for credit. Quandis' MLA Search results are performed in real time against the DMDC database, so they're always fresh - never stale. Thus, the 30 day 'clock' starts upon receipt of the results from Quandis. If the creditor knowingly violates the rules, it is a misdemeanor.